My folks are in town for a few weeks. We wanted to make some German/Austrian food while they were visiting. Today we made Marillenknödel (German for Apricot Dumplings) for lunch. They are apricots wrapped in a cheese dough, then cooked in simmering water for 15 minutes. Then you roll the dumplings in toasted breadcrumbs and coconut flakes. Sprinkle each crumb coated dumpling with a little sugar and extra breading on the side and enjoy. It was nice to work with my mother to make these. One word of caution though, if the fruit is very juicy you need to take care or it could squirt hot fruit juice. You could easily swap out the fruit with plums (but they would be called “Zwetschkenknödel”in German). Mix cream cheese, egg and salt together. Gradually add flour – enough to make the dough not overly sticky and easy to handle, but soft and pliable. Split the dough into 6 equal size balls. Flour a pastry board and us a rolling pin to gently make small discs of dough. Roll the apricots in flour and place in center of the dough rounds. Gently wrap the dough around the fruit and seal the seams. Repeat with remaining dough and fruit. The process of wrapping the dough takes some patience, but it is well worth the effort. Allow the dumplings to rest (at room temperature) while you get a large pot of water to the boiling point. When it is at a full boil, lower the dumplings carefully into the hot water. They may sink to the bottom while others may float. Lower the heat so it is still simmering, but not a full boil while the dumplings are in the water. Gently stir the bottom of the pot with a wooden spoon to loosen any dumplings that may stick to the bottom, but this is usually not a problem. Cook for about 15 minutes. In a large non stick skillet, over medium heat, melt butter. Add the dry breadcrumbs (Progresso is fine) and coconut flakes and stir to toast the crumbs. Remove the dumplings with a slotted spoon and place in the crumb mixture, carefully roll and spoon the crumbs over the dumplings. Place on a serving platter. To serve, sprinkle each dumpling with about 1/2 tsp of sugar and enjoy. This makes a great breakfast, lunch or dessert. Categories: Dessert - Fruit, Desserts, Ethnic, Ethnic - German, Fruit, My Mom's Recipes | Tags: Austrian Apricot Dumplings, Marillenknödel | Permalink. Here is another very German/Austrian meal. We would sometimes have this for dinner, but more frequently as a dessert. 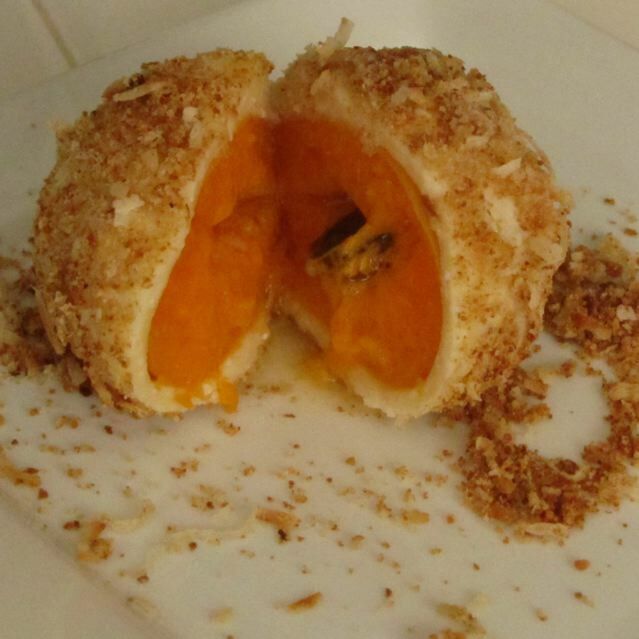 A lovely cream cheese dough is wrapped around an apricot (or plum -Zwetschken) and then it is boiled in water and rolled in toasted breadcrumbs and sprinkled with sugar. A word of caution if you are going to eat these after you make them (that usually happens around my house) They are quite hot on the center and depending on how juicy your fruit was to start with it does tend to squirt hot juice from the fruit and can scald – so please be careful! How do you eat it? with a fork. It is a great summer dessert. Also beware the pit! This recipe is also from my mom. There are several different dough variations used. This one is close to the Topfenteig (Topfen also called Quark in Germany) is similar to cream cheese, but not exactly, I have had to take some liberties with the ingredients. Other doughs that are often made are Brandteig (similar to the dough you would use making cream puffs) and Kartoffelteig (potato dough). Our family most frequently made the Topfen (cheese) dough. Mix creamed cheese, egg, salt. Gradually add flour. Flour hands, take a piece of dough, pat it flat and wrap the fruit in it. Drop in boiling, slightly salted water for about 10 minutes. Fruit balls will float so use a large pot. In the meantime, brown breadcrumbs in margarine. When dumplings are done, roll them in the browned breadcrumbs and sprinkle with sugar and serve. Categories: Dessert - Fruit, Ethnic - German, My Mom's Recipes | Tags: German recipe | Permalink. There are cakes that turn your head when you see them. I think this one falls into that category. My mother would make this cake for special occasions. One such occasion was my leaving from NY to England for a semester of school. It was the dead of winter and NY had become paralyzed by a blizzard. Flights were delayed for hours. I met up with another friend who was flying to the same place and my parents and one of my aunts met us at the airport as well. We had quite the party there in the airport eating Black Forest Cherry Cake in the terminal — my parents said that there were quite a few jealous looks. This recipe is from my mom. Enjoy. Pat mixture into 10-inch “spring form” lined cake pan and poke holes in it with a fork. Bake for 15 minutes at 400°F. Pour over the above mixture and fold under. Pour batter into a paper lines spring form. Bake at 375° F for 25-30 minute and let cool. Slice the cooled cake to make two layers. Mix a bit of kirsch or rum flavoring with tart cherry pie filling. Beat 2 1/2 cups of whipping cream together with 1/2 cup powdered sugar. Dissolve 1 Tbps. of Knox gelatin in 2 Tbps of water. Bring to a boil. Add gelatin to half of the whipping cream for the outer cake frosting. Spread 1/2 of cherry filling on the bottom crust. Add a layer of whipped cream on top of the cherry filling. Place sponge cake layers on top of this and add more filling and whipped cream. Use the whipped cream mixed with gelatin to frost the cake. Sprinkle flakes of grated chocolate bar over the frosting. Place cherries around the outer top for decoration. Enjoy! Categories: Baking, Baking - Desserts, Dessert - Cakes, Ethnic, Ethnic - German, Holidays, My Mom's Recipes | Tags: Authenic, Authentic Black Forest Cherry Cake, Black Forest Cake, Black Forest Cherry Cake, Chocolate Cake, German recipe | Permalink. Here is a recipe I got from my dear mother-in-law when I married my husband. She was a warm and wonderful individual with a sweet spirit and generous heart. She was inspiring in her battle against cancer, which she lost in 1994, 12 years after her initial diagnosis. Susan will be in our hearts and minds forever. I am sorry my children did not get to know her. She and her husband Frank raised four terrific boys who grew into wonderful, caring men. This past February my father-in-law also passed away. But the legacy is carried on. Memories of them will not be soon forgotten. This recipe was passed down from my husband’s grandmother who was a German immigrant. Enjoy! Categories: Breakfast, Ethnic, Ethnic - German, Family Cooks, Favorite, Fruit, My Mom's Recipes | Tags: Apple Pancakes, German recipe | Permalink. This is a wonderful refreshing dish that I love to serve at our home. My husband and I seem to always battle for the last bowl when the late night munchies hit. We end up sharing! 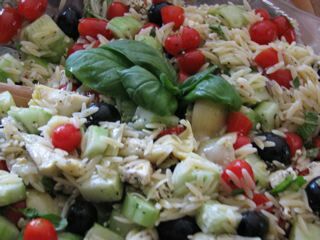 It is an easy dish to put together, chop your veggies and such while the pasta cooks and then cool the orzo under running cold water and it is a flash to assemble. The beauty of this dish is you can put any veggies in you want. My mom made this with green beans once and broccoli another time. Both were delicious. I happen to like this combination the best. But if you did not like artichokes, or cucumbers – substitute away! Cook the Pasta according to the directions. Prepare the vegetables, and put in a large bowl. When the pasta is cooked, drained and cooled, add to the chopped veggies. Combine the ingredients of the dressing and pour over the pasta salad. Combine. Add the feta cheese last, it seems to hold together better then. Enjoy. This really is quite addicting. I think you will find it is as well. Categories: Ethnic - Greek, Family Cooks, My Mom's Recipes, Side Dish - Pasta, Side Dish - Salad, Side Dishes | Tags: Food, Greek, Orzo, Orzo Salad, Pasta, Recipes, Salad | Permalink.